When it comes to choosing your wet shaving brush, the kind of hair you use is important. There is badger hair, boar hair, any type of hair you might imagine (except human hair, thank you very much) – however, horse hair has quite a few advantages as a shaving brush apparatus. Horse hair is animal-friendly, affordable, and much softer than boar’s hair. It is a nice middle ground between badger and boar in terms of hair stiffness, making them a perfect alternative to use for wet shaving. We did some research, and here are the five best horse hair shaving brushes we think are out there that you can use without going electric or growing a well trimmed beard. 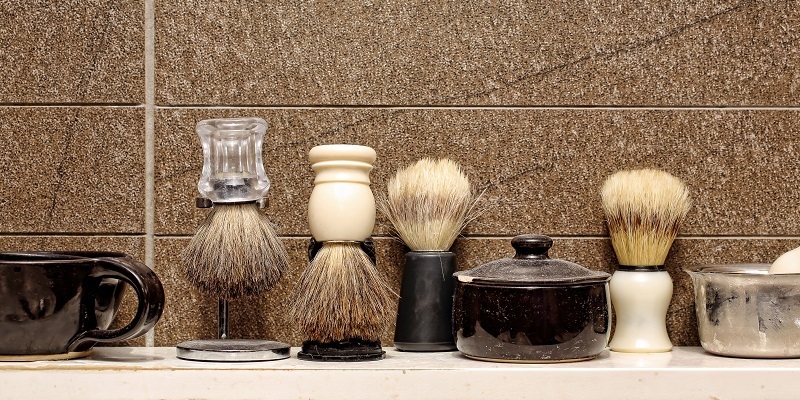 Shaving brushes have been around for a really long time…like 250 years kind of long. Around the early 1800’s the folding handle straight razor was introduced, which allowed men to shave at home if they had the funds to purchase the new razor. This was when the shaving brush first made the rounds in France and they were developed to allow those with straight razors to skip out on having to go to a barber, but still get the great shave they wanted. It didn’t take long for shaving brushes to gain steam and become the “it” thing to buy as well as becoming an integral part of at home shaving routines. There was a variation in quality at first, but the growing popularity came better quality. Soon, handles were made out of exotic materials like ivory, porcelain, crystal, tortoise, shell and even gold. Many even had intricate designs carved on them to enhance the visual appearance. Badger hair shaving brushes with fancy handles became a status symbol in no time. The quality of the brush you buy will depend on the quality of the hair that is used. The denser and softer the bristles are means that your brush will hold more water. More water retention will result in a super rich and creamy lather. The handle of your shaving brush is more important than you might think and can make a difference in your daily shave. You want a handle that is comfortable to hold and durable so that it lasts you a long time. If you are really into shaving brushes, you can even get one that has a handle to match your personality. There are a variety of handles that are made out of many different materials , so there is likely to be something that strikes your fancy. So, when shopping for a shaving brush find the bristle gradient that you like the most and then try to find a handle that fits just right too! If you are new to using a shaving brush, we are going to tell you briefly how to do so. All of these same steps apply to all bristles styles no matter if you have one made with horse hair, badger hair or boar hair. Most brushes come from the Spanish company Vie-Long, and for good reason – the Spanish seem to particularly love horse hair as a viable end to their wet shaving brushes, because of its rampant availability over there and the stiff-but-not-too-stiff feeling. With the Vie-Long 13070 brush, you get a nice mix of style and function, with a nice inviting tuft of white horse hair atop a lovingly finished wood handle. The dark marbling on the light wood is definitely a gorgeous sight to look at, and the sharply concave groove near the bottom of the handle gives it a nice grip for you to keep hold of your brush. The craftsmanship, as per most of Vie-Long’ s brushes, is superb, and you’ll really want to take care of this particular brush if you want to make sure it lasts you a long time. This is probably one of the more expensive horse hair shaving brushes out there (at about $32), but it won’t break the bank to give you such a wonderful command over your shaving experience. If you want something a little more heavy-metal, the 04312 is a rather interesting model to consider. It has a wooden handle not dissimilar to the 13070, but only on the bottom half; the top half is made of a large, chromelike metal that contrasts beautifully with the grooved wood of the rest of the handle. If you want a little more tactile coldness to your shaving brushstrokes, the 04312 would likely not steer you wrong. There is a textured ring around the metal component that makes it ideal for grip, and the glossy finish on the wood handle still keeps it classy enough that it doesn’t look too garish or obnoxiously futuristic. We can see a bit of an old-world poolhall feel to this particular brush, which wet shaving aficionados might take to quite well. This brush is also a little on the long side, but this has other benefits in the form of a longer brushstroke; you’ll get much more of that soft horse hair to work with, making lathering easier. At about $20, it’s not terrifically expensive as well, which makes it advantageous for any kind of shaving investment. Yet another dramatically different horse hair shaving brush design is found in the 13061; here, we have a broadly concave shaving brush, with a red-and-white acrylic handle. The blood-red top of the handle lends it a dramatic flair, while the white bottom has a textured ripple throughout it, as if a floating silk were suspended in mid-air. It’s a very striking approach to shaving brush design, something which is augmented by the slightly bigger shape. This brush has a much wider knot of horse hair, making for wider surface area when lathering and applying, but it is stouter so you’ll need more brush strokes in general to get your lubrication on. While the price itself is a bit steeper (around the range of the 13070), its unique design and wider knot is worth it for those looking for a greater sense of uniqueness to their brushes. While Vie-Long dominates the market in horse hair shaving brushes, there are other contenders as well. This one, from Fromm-Diane, is an extremely affordable option – its biggest draw is its price, which is about $4. Because of that, the brush itself is a bit smaller; the knot is thinner than most others on the market, so it is advisable to get it if you want more precision work on your lathering. The stark black handle is just as thin, so it might fit grips that would find other brush handles cumbersome. One other advantage to this is that the horse hairs feel a bit softer than the Vie-Long brand; I am unsure what to attribute this to (different horses, I suppose? ), but it is certainly a comfort on the chin. Nonetheless, this provides a very disparate option to the Vie-Long brands, which emphasize style over softness at times.